After spending a morning with Gaudi’s idiosyncratic architecture in the church of Sagrada Familia and then in the apartment building called the Casa Mila or La Pedreda, The Family and I went off to a nearby restaurant for one of Barcelona’s famous three course lunches. Gaudi’s architecture is mesmerizing, and both of us were a little stunned by the decorativeness of his style. During lunch The Family asked who the other famous architects in Barcelona are. Now Barcelona has works by so many brilliant architects, that I fumbled for an answer. 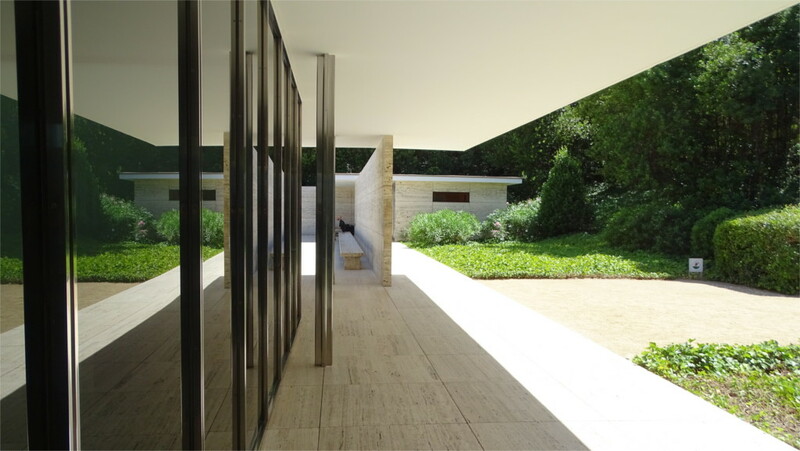 When I blurted out "Mies van der Rohe", it was my subconscious speaking. My first acquaintance with the work of one of the makers of modernist architecture was through photos of the Barcelona chair, which (I later found) were designed to go with his German Pavilion in the Barcelona World Fair of 1929. One of the iconic structures designed by him was this pavilion. I was under the impression that it was dismantled within a year of being set up, but was surprised to find, just a few months ago, that it had been reconstructed. So we found the simplest connection through the subway to take us there, finished our coffee, and set off into the hot afternoon. The clean lines of the pavilion are a refreshing sight after a morning of Gaudy excess. There is a small fee for entry, which we gladly paid, as we walked past the glass curtain "into" the structure. The interesting thing about this pavilion is that there is really no inside and no outside. The walls do not partition the structure; rather they offer a continuous path through the structure. 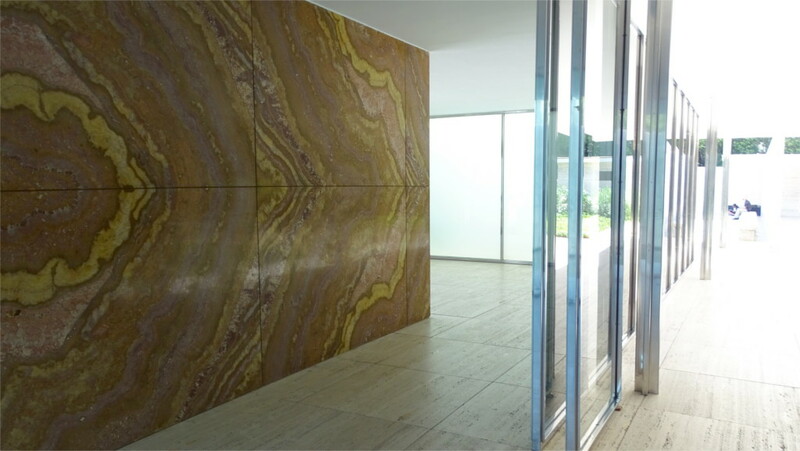 Immediately behind the glass curtain is this wall of red-gold onyx (photo above). When you go round this wall another curtain of glass appears (photo above), and you must decide whether to pass in front of it, or behind. The slab of the roof floats lightly above this, providing welcome shade. There were a very small number of people taking photos, very considerately moving out of the field of view of each others’ cameras. On the far side of the view above was the rectangular pool which is called the large basin. Behind me was the small basin (photo above) with a statue called Alba by George Kolbe. 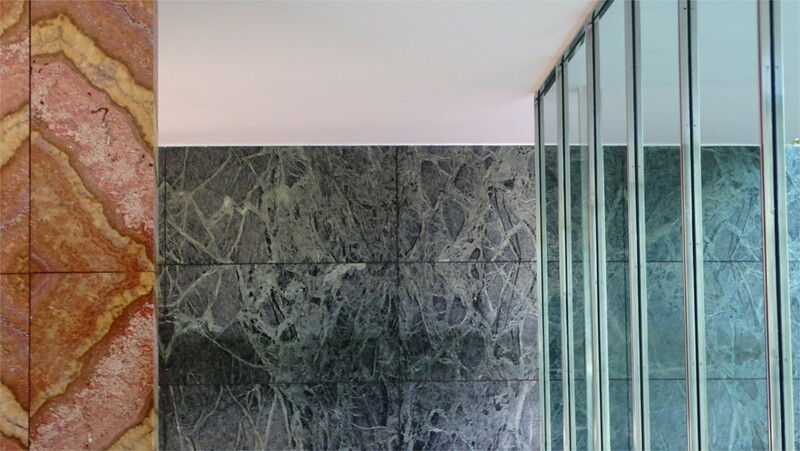 The U-shaped wall behind it is made with green marble, and creates the main enclosed space in the pavilion. Interestingly, there is no roof above it, so that in another dimension it is open. I found one place from which you could see all the different kinds of material used in this structure (photo above). This was the wall where a few of the Barcelona chairs had been placed (featured photo). The Family sat down on one of the chairs and declared that it was indeed comfortable. Was it the most comfortable chair ever designed, as advertisements used to claim once? She was not sure, but she said she could sleep in it. I’d always thought of the Barcelona chair as black, but it turns out that the first edition, which was placed here in 1929, was white. We sat there together and contemplated the vision which has now conquered the world. 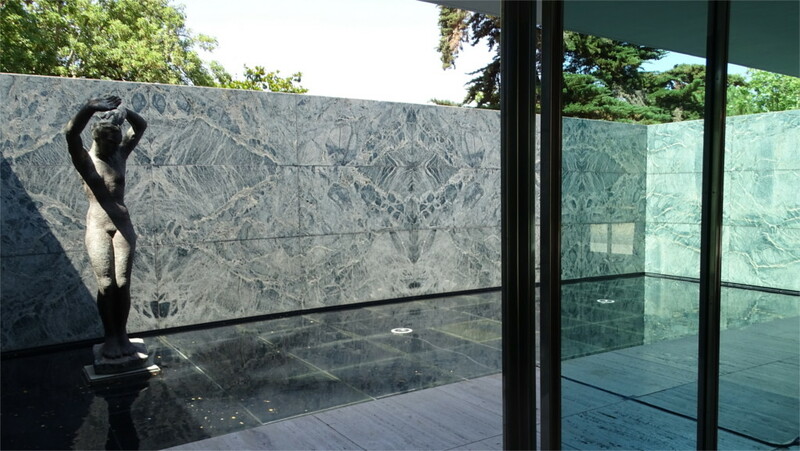 If the Barcelona Pavilion seems to be so ordinary, it is because every modern atrium looks faintly like this: the mixture of exotic polished stone and steel and glass curtains, soaring above you. Even the little pool with Kolbe’s architecture has been copied and transmuted. This is why Casa Mila stands out as extraordinary: it is not the way the world is. I’m happy that the world followed Mies van der Rohe’s vision and not Gaudi’s. fascinating post and such contrasting styles … lost the anti-…. Thanks. They are the antithesis of each other in some ways, aren’t they? Very interesting! I did not know those chairs were called Barcelona, and also thought they were originally black; I definitely like the white better. The white went very well with the pavilion. You can really see the appeal of the simple modern designs. Thanks for playing along.